Simpson was shocked to be met by Celtic assistant manager, Sean Fallon and be informed that Celtic craved his signature. There were two reasons for him to be surprised. Firstly, that his best days were said to have been behind him as he was only days away from his 34th birthday, and secondly, his father, Jimmy Simpson, had been a very successful Rangers captain in the 1930’s. This was not a problem for Celtic or Simpson senior and Jimmy Simpson was to spend many happy days at Parkhead watching his son and was always treated with total respect by everyone at the club. Eyes were raised at Simpson’s arrival and the expectation was that he would be put in the reserves to assist the youngsters breaking through. 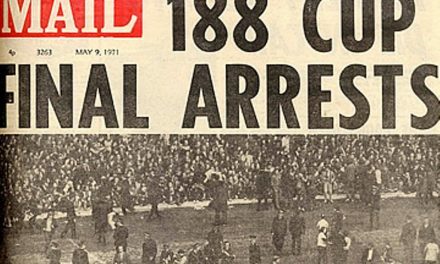 However, the plot thickened in March 1965 when Jock Stein arrived at Celtic Park in a blaze of publicity. Stein had moved Simpson out of Easter Road and Ronnie now expected the same fate to befall him at Parkhead. Thankfully, Stein was astute enough to see the merits of retaining Ronnie and any problems they had previously experienced with each other were thankfully put behind them. Ronnie became Celtic’s number one choice as goalkeeper at the start of the 1965-66 season and embarked on a wonderful closing five years of his footballing career. 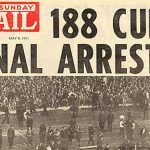 In October 1965 the League Cup was won and in May 1966, on an wonderfully emotional day at Fir Park, Celtic won their first league title since 1954. An emotional Ronnie was raised high by his Celtic team mates and paraded in front of the ecstatic Celtic fans in acknowledgement of his age. 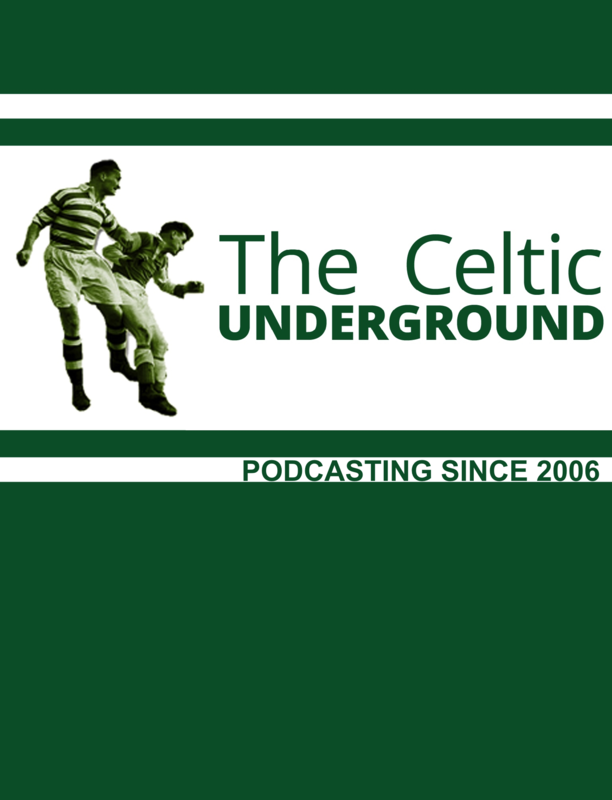 The title had been won by a narrow margin and Ronnie played a huge part in ensuring that Celtic had come through. Little did he know that far more success was to come his way. The 1966-67 season is well documented but there are three Simpson highlights to note and all took place within a four week spell in the Spring of 1967. In April, Ronnie was selected for Scotland to play England at Wembley. This was an era when the biggest ambition of most Scottish footballers was not only to play England at Wembley but to beat them. On a memorable day, Scotland turned on the style to win more convincingly than the 3-2 scoreline suggests with elder statesman Ronnie and the teenage striker Jim McCalliog grabbing most of the headlines. 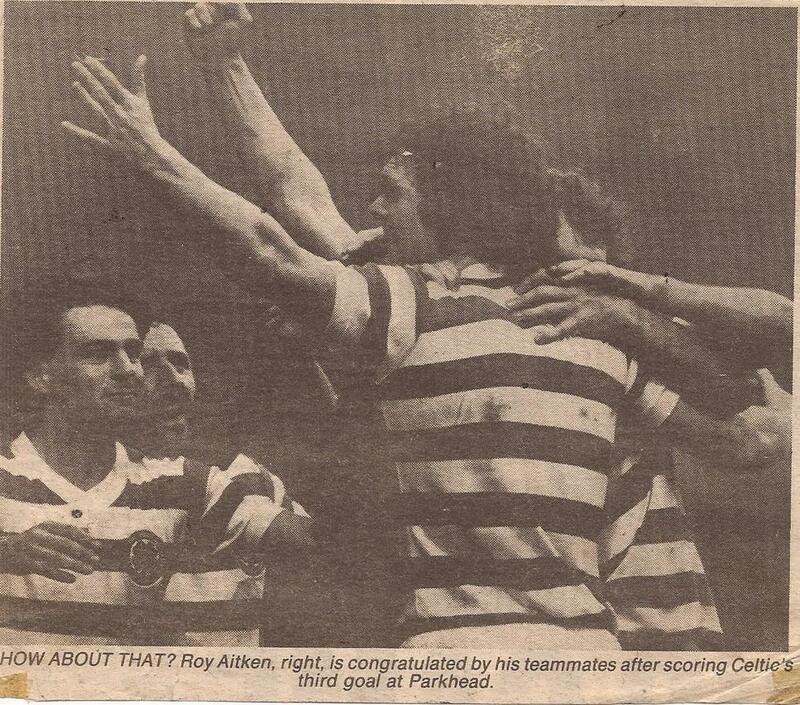 Two weeks later Ronnie won his first Scottish Cup winners medal when Celtic beat Aberdeen 2-0.It was notable that the Aberdeen players made a fuss of Ronnie at the final whistle, acknowledging the fact that he now had a cup medal at the ripe old age of 36. There is no doubt that Ronnie’s career highlight came when Celtic beat Inter Milan 2-1 in Lisbon in May 1967. 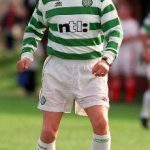 In truth, Ronnie had very little to do that day but he provided a wonderful cameo during that game when he found himself having to race outside his penalty area to stop an Inter attack and proceeded to coolly back heel the ball to John Clark, an act which only added to Celtic legend on that great day. At the final whistle, Ronnie was overcome with emotion that he had won such a prestigious medal at such a mature age. This was Celtic’s glory years and the trophies piled up for Ronnie. 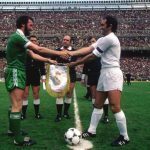 There was a sad event in November 1967 when he was struck by a missile in Buenos Aires before the world championship game against Racing Club, an act which severely disrupted Celtic’s preparation for that match. Ronnie wasn’t a tall goalkeeper but was tremendously agile. He was one of the first goalkeeper to realise the value of blocking a shot with his feet and other parts of the body other than his hands. This was seen as somewhat unorthodox at that time and it’s interesting to note he rarely used gloves. Of the many great games Ronnie had for Celtic, perhaps his finest was in August 1968 when Celtic won 2-0 at Ibrox with Ronnie defying the Rangers forwards with a succession of great saves. This prompted the following letter to be printed in Jimmy Hill’s Soccer Weekly magazine from an R. Bisland in Skerry Street, Glasgow. Sir – Through your magazine I would like to pay tribute to a brilliant goalkeeper. It was during the recent Rangers – Celtic game and Celtic had a two goal lead at half time. But after half time, Rangers hammered Celtic, brilliant shots came in from all angles but this ‘keeper would not be beaten. Then a cross came in from the left – Smith, Rangers’ inside-right ran forward, jumped and met it thigh high. It was a tremendous shot but the ‘keeper, with tremendous reflexes, punched it over the bar. 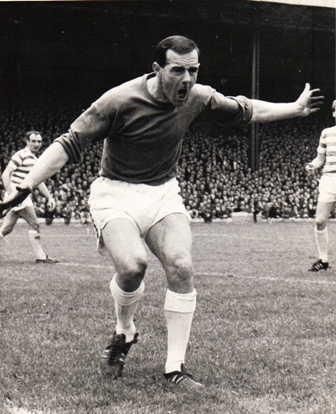 The goalkeeper was Ronnie Simpson, the old man of Celtic. I’m sure he’ll never have another game like it. Without him Celtic would have been thrashed. This was a goalkeeping display better than anything I saw in the World Cup. AND I’m a Rangers supporter ! 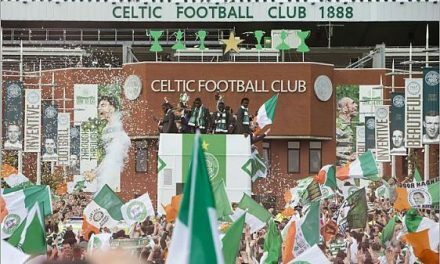 Few Celtic players can claim to have such an accolade from a fan of their greatest rivals. In February 1969 Ronnie badly injured his shoulder against Clyde at Shawfield after an accidental collision with Clyde’s Jimmy Quinn, who was actually on loan from Celtic. 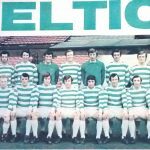 This kept him out for a long period although he returned to action in the autumn of 1969 when he injured the same shoulder at Hampden against Ayr United in a League Cup semi final. He was taken from the field, clearly in pain and this time there was to be no return. At the grand old age of 39, Ronnie Simpson returned from playing with the grand old team. Very few Celtic players enjoyed the respect, admiration and affection from the Celtic supporters than Ronnie. He was revered by them and there was deep sorrow when he retired as he still had years left in the tank. Ronnie Simpson could not for one moment have realised what lay ahead of him back in 1964 when Sean Fallon took him from Hibernian. Four league titles, one Scottish Cup, four League Cups and a European Cup are testament to ‘Faither’s’ contribution to Celtic’s success. Of all the romantic stories in football you will not find one as heart warming than that of Ronnie Simpson’s Celtic years.